High-performance hardware meets low-key design in the Huawei Honor 6, at a price that's frankly hard to beat. In a market segment where budget matters, the Honor 6 is offering some top-of-the-range specs to raise itself above the crowd. The Honor 6 comes in an understated all-glass body that could have easily carried an Xperia badge. Speaking of, Honor is the only sort of branding and the Huawei logo is nowhere to be seen. Whatever marketing strategies are at play, the company's expertise is undeniable and is surely carried over to the Honor 6. 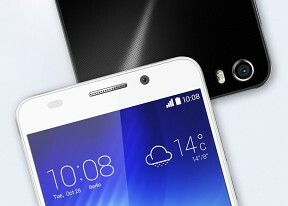 Just because the Honor 6 isn't readily identifiable though, doesn't mean it's not well built. Actually, if you manage to keep it clean, it's quite a looker. Yet, its focus is clearly elsewhere. The device is aiming for a top spot on the bang-for-your-buck chart and on paper its outlook is promising. The phone packs a powerful home-brewed Kirin 920 chipset with an octa-core processor, backed up by an ample 3GB of RAM. You get a 5" display which some consider the limit for pocketability, and it's also a FullHD panel, so everything should be tack-sharp. Imaging is duly covered both back and front. A 13MP main camera with dual-LED flash for the major photography occasions is backed by a 5MP wide angle font-facer for the selfies that just have to be posted and shared. Another solid spec is the battery capacity, where Huawei claims the 3100mAh unit will keep the Honor 6 going for two full days. The above list points to a rich and balanced package with no major flaws to speak of - except perhaps the OS version but that's mendable. The hardware is well-thought of and promises solid performance, hard to match in a device costing €300/$340. While the battery may not be user-replaceable, its high capacity should offset that shortcoming. And the other disadvantages clearly fall in the "minor niggle" category. You could have read most of the above on the specs page though, and that's not why you're here. Join us on the following pages where we put the Honor 6 through our usual test routine. It's running marshmallow currently without any rooting or flashing,just download emui 4 for H60-LO4 and download and keep it in a file dload in internal storage , then a system update will come and u need to. Update.